Among the endorsers of the L.A. protest were United Teachers Los Angeles (UTLA) as well as other local labor organizations such as United Steelworkers (USW) Local Union 675. Additional endorsers included the National Lawyers Guild (NLG) Los Angeles Chapter, former Black Panther leaders Elaine Brown and David Hilliard, the Pan African Union at Cal State University Dominguez Hills and the Committee for the Defense of Human Rights (SF8), which is defending eight former Black Panthers who are now being dragged through the courts on frame-up charges of killing a cop that had been dismissed 30 years ago. Henry Walton’s Labor Review program on radio station KPFK helped publicize the demonstration. UCLA students marched to the rally from the nearby campus, kicking off the protest. Chanting “Labor has the power to make the courts bow! 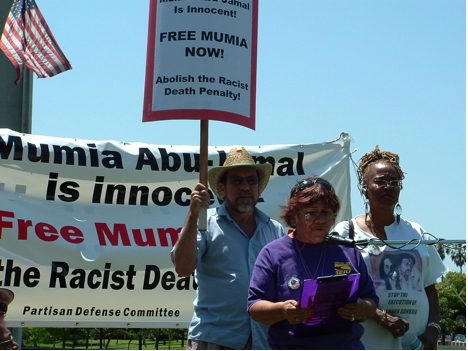 Mumia is innocent! Free him now!” and “Mumia, Mumia must go free! Down with the racist death penalty!” demonstrators made clear their determination to fight against the court’s ruling, which will either result in a new death sentence or life in prison hell. 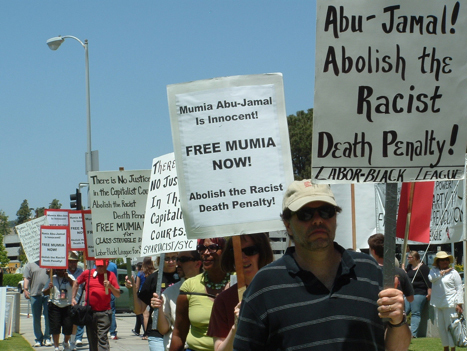 Don White, coordinator of the Committee in Solidarity with the People of El Salvador-L.A. (CISPES), reminded demonstrators that Mumia remains a powerful journalist whose commentaries regularly air on KPFK. Also speaking at the rally was Sherman Austin, founder of Raise the Fist Direct Action Network, who performed his hip-hop protest songs “Raise the Fist” and “Freedom.” Cailin Crockett, speaking for the UCLA Bruin Feminists for Equality, said that “this struggle for Mumia’s innocence, which is clearly proven, is…a human rights issue and it is a representation of the fundamental inequalities in this country.” Walter Lippmann, editor-in-chief of the online CubaNews, called for Mumia’s freedom and told demonstrators that the Spanish translation of Mumia’s book We Want Freedom is widely available in Cuba, where “Mumia’s case is followed closely. He is viewed as a leader and a teacher in the struggle for justice in the United States.” He also spoke in defense of the Cuban Five, victims of a political frame-up. Present at the protest, but not endorsing or speaking, were supporters of the Spark organization.